My good friend Chris Edwards at the Cato Institute has released the latest gubernatorial report card. Now in it s14th edition, it is an impressive piece of data work and analysis that gives us a great idea of how governors across the country are doing. Including, of course, our own beloved Matthew H Mead. Cato gives him a B in their total score, which is an index of seven tax and spending variables. With a score of 61 out of 100, he is 12 points and eight places behind the best-ranked governor, Susana Martinez of New Mexico. Mead gets rightfully criticized for having signed a few tax hike bills, including the 2013 gas tax. What the report does not mention - understandably so - is that in the lead-up to the 2018 session, the Revenue Committee had almost half-a-billion dollars worth of Taxmageddon on its table, and Mead never got a chance to show his colors on that package. Since the Cato report is concentrated on what the governors actually were presented with by their legislatures, we cannot judge Mead on those tax proposals, but from what I saw during that session, it is more than a 50 percent likelihood that he would have signed them. Source: National Association of State Budget Officers; preliminary data for 2018 will be available in December. In 2011, 46 percent of state spending came out of the General Fund. 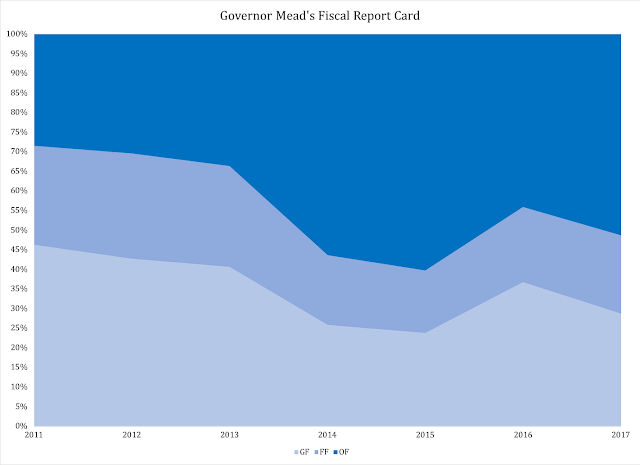 In 2017, with one year left to go for Mead, the General Fund represented less than 29 percent of all state spending. During that same period of time, Other Funds spending grew from 28.5 percent to 51 percent. In other words, more than half of all state spending here in Wyoming is run through Other Funds. In fairness to Mead, total state spending declined from 2011 to 2017 from $6.1 billion to $5 billion. We should note that this definition of spending is a bit narrower than the one used by the Census Bureau; when The Wyoming Center for Political Economy is up and running, we will develop a tutorial on how to read government spending. For now, let us accept the NASBO numbers reported here. The shift from General Fund to Other Funds in Wyoming is anomalous to the national trend: in 2011, the total General Fund spending of all state governments accounted for 38 percent of all spending, while Other Funds was just below 28 percent. In 2017 the respective numbers were 40 percent and 28.5 percent. Stable relationships, in other words.